This office bookcase set provides you with all your storage needs for books and collectables. Each bookcase comes standard with five adjustable shelves however extra shelves can also be ordered if needed. 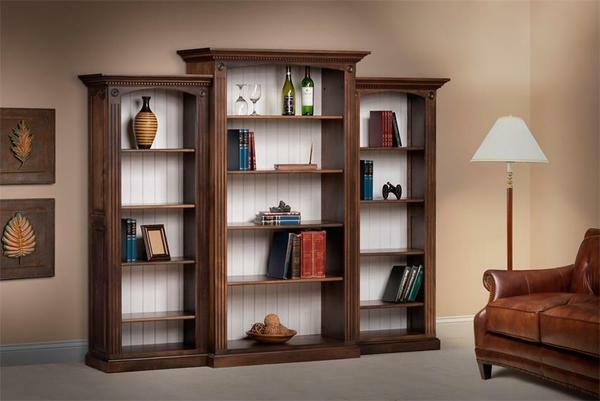 The bookcase has beautiful craftsmanship features such as dental molding, rosettes and flutes. If you prefer to have the piece custom made without some of these formal features then just give us a call and we can customize this bookcase for you. Bookcases are a popular and easy thing for our Amish woodworkers to customize. Wonderfully crafted piece of furniture. Am very pleased with the finished product and all the help I received a long the way. Look forward to ordering more furniture in the very near future. He loves, loves, loves the bookcases! He smiles everytime he walks into his office! Thanks!